This PDF 1.6 document has been generated by / iText 2.1.7 by 1T3XT, and has been sent on pdf-archive.com on 11/08/2016 at 04:13, from IP address 205.154.x.x. The current document download page has been viewed 188 times. therapeutic cancer vaccine that delivers tumor antigens to stimulate anti-cancer immunity. at the 2016 Phacilitate Immunotherapy World Conference in Washington DC. Low Recurrence Rate and Signal of Immune Infiltration with HS-410 Monotherapy. specimens taken from patients treated with HS-410, which were not observed at baseline. the activity of HS-410 as a monotherapy in NMIBC. Q2 2016 – Immune response data from DURGA Phase Ib trial. 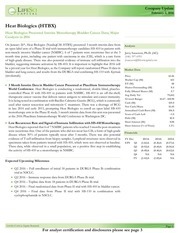 Q4 2016 – Topline data from 18 patients in DURGA Phase Ib trial. Q4 2016 – Final randomized data from Phase II trial with HS-410 in bladder cancer. significant commercial opportunity for newly approved agents. a strong scientific rationale for combining therapeutic cancer vaccines such as HS-110 with agents that inhibit the checkpoint blockade. second quarter of 2016, and topline tumor response data may be reported in the fourth quarter of 2016.
expected to be filed in the fourth quarter of 2016. FDA approved drugs in its portfolio. The Company’s lead program has not yet entered Phase III trials and has limited data to date. and sales may not meet expectations. a market in the securities of the subject company. more of any class of common equity securities of the subject company. announcements, market conditions or any other publicly available information. Additional information is available upon request. No part of this report may be reproduced in any form without the express written permission of LSC. Copyright 2015. This file has been shared by a user of PDF Archive. Document ID: 00412634.